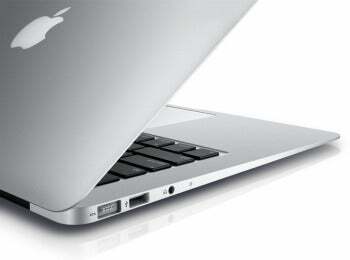 Is Apple's New MacBook Air Poised to Launch Soon? Apple's next-generation MacBook Air could launch soon, though that's if you're bending over backward to interpret DigiTimes' latest report in the most optimistic light. The Asian news site reports notebook manufacturers are expected to see February shipments grow about 10 percent after a lackluster January, and that Apple is "set to launch a new MacBook Air model," bolstering Taiwan-based supplier Quanta Computer's revenues. Besides "set to launch," we've in past months heard the new MacBook Airs will include processors from Intel's upcoming Ivy Bridge (22 nanometer) family. Documents leaked to VR-Zone in December suggested Intel was dropping its 25W "Low Voltage" processors in favor of "Ultra Low Voltage" versions that use just 17W. Those processors would reportedly run at speeds of 1.8GHz and 2GHz. The MacBook Air currently tops out at 1.7GHz (Intel Core i5) in the 13-inch model -- there's a "dual-core 1.8GHz Intel Core i7 with 4MB shared L3 cache" option, but only if you order through Apple's online store. The MacBook Air lineup was last updated in July. Rumors circulated last year that Apple might roll out a 15-inch version of the Air, and with talk of larger Airs, I've wondered whether Cupertino might not merge the Air and Pro lines outright. But if Apple's in fact planning to keep the Air and Pro lines separate, as recent rumors suggest, would you really want a 15-inch Air? A "nerfed" version of a 15-inch Pro? An 11-inch MacBook Air and a 1366 x 768 screen as a primary work machine turns out to be too limiting for me, not to mention all the applications with dialogue boxes that disappear off the bottom of my screen unless I hide OS X's dock (I'm looking at you, MS Office 11 and Adobe Photoshop CS5). But 15 inches sounds ginormous for an ultraportable. If you're going to spend that kind of money, why wouldn't you want something decked out, Pro-style, with a discrete graphics card and high-clock processor? I'd wager money someone's going to reply that a lightweight, ultraslim, relatively low-end 15-inch MacBook is all they've been dreaming of since the Air first appeared in January 2008. And if suggestions that a 15-inch Air is just Apple's reaction to the burgeoning ultrabook market, where 15-inch models are popping up everywhere, who can blame the company. But the Air's appeal, from my standpoint, is how much power it's able to pack into a profile the size of a file folder. At 15-inches, you've traded away much of that upside for screen real estate (for which, expect Apple to charge a premium -- less than a 15-inch Pro, but considerably more than a 13-inch Air, I'm betting). And to avoid conflicting with the new Pros, Apple's surely going to keep the CPU and graphics processor ceilings low. So with all the respect in the world for those of you on tenterhooks about a 15-inch Air, I'll be waiting for Cupertino to roll out its design-overhauled Pros, which are expected to adopt the Air's slim, tapering profile anyway. If you're going to go 15 inches (or bigger) and spend that kind of dough, why scrimp on processing oomph?